Ansett 'Airporter' bus, drops passengers at the Horn Island Airport, Torres Strait, 1976. Slide by Betty Daly, Collection of the Centre for the Government of Queensland. Ansett F27 aircraft, Horn Island, Torres Strait, 1976. Slide by Betty Daly, Collection of the Centre for the Government of Queensland. Ansett F27 aircraft at Weipa airstrip, 1976. Slide by Betty Daly, Collection of the Centre for the Government of Queensland. TAA passenger aircraft at Brisbane Airport, Eagle Farm, 1970. One of the many small airlines servicing the Great Barrier Reef islands. Aircraft, Lindeman Aerial Services, Lindeman Island, 1966. Slide by Robin Barron, Collection of the Centre for the Government of Queensland. Yowah ‘International Airport’ servicing the Yowah opal field, 140 km west of Cunnamulla, 1991. Slide by Audrey Johnston, Collection of the Centre for the Government of Queensland. Passengers boarding a De Havilland Dragon aircraft at Cracow. The gold mining town of Cracow, two days journey by road from Rockhampton, was established in the 1930s. Ron Adair’s Aircrafts Pty Ltd commenced flights to the town on 29 December 1930, in a way not dissimilar to today’s fly-in/fly-out services to the mining industry. 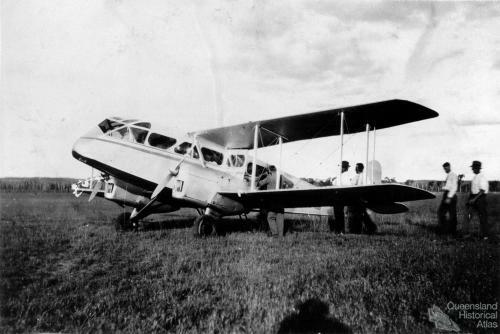 From February 1934 Aircrafts Pty Ltd was one of a small number of aviation organisations subsidised by the Commonwealth through a Special Grant because of their services to the community.